This section describes installing and using jails on FreeNAS® version 11.2 or later. 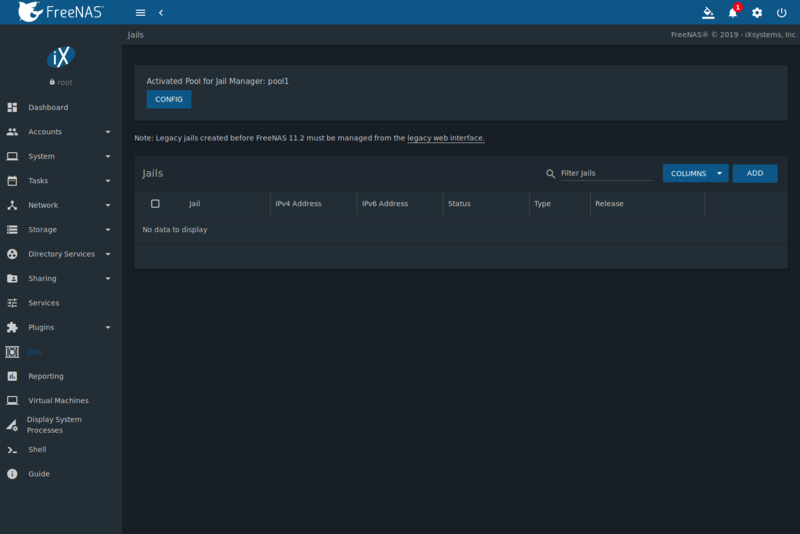 Any jails created with a previous version of FreeNAS® must be managed with the Legacy Web Interface. Jails are a lightweight, operating-system-level virtualization. One or multiple services can run in a jail, isolating those services from the host FreeNAS® system. FreeNAS® uses the iocage utility for jail management. Jails are also used as the basis for FreeNAS® Plugins. The main differences between a user-created jail and a plugin are that plugins are preconfigured and usually provide only a single service. By default, jails run the FreeBSD operating system. These jails are independent instances of FreeBSD. The jail uses the host hardware and runs on the host kernel, avoiding most of the overhead usually associated with virtualization. The jail installs FreeBSD software management utilities so FreeBSD packages or ports can be installed from the jail command line. This allows for FreeBSD ports to be compiled and FreeBSD packages to be installed from the command line of the jail. It is important to understand that users, groups, installed software, and configurations within a jail are isolated from both the FreeNAS® host operating system and any other jails running on that system. 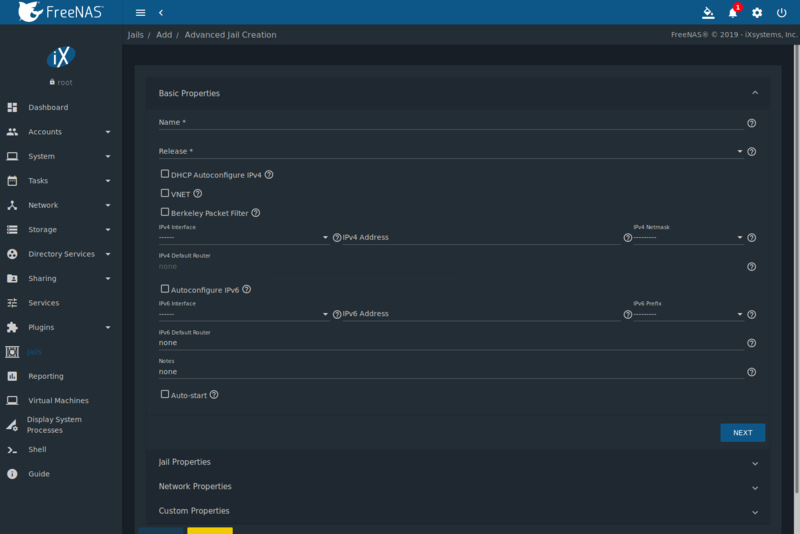 During creation, set the VNET option to provide the jail with an independent networking stack. The jail is then able to broadcast an IP address, which is required by some applications. The ability to create multiple jails offers flexibility regarding software management. For example, an administrator can choose to provide application separation by installing different applications in each jail, to create one jail for all installed applications, or to mix and match how software is installed into each jail. A pool must be created before using jails or Plugins. Make sure the pool has enough storage for all the intended jails and plugins. The Jails screen displays a message and button to CREATE POOL if no pools exist on the FreeNAS® system. Multiple pools can be activated to store iocage jails and plugins. After a pool is created, the Jails page displays an Activated Pool section. This shows which pool and iocage dataset is active with FreeNAS®. Click CONFIG to view the option to choose another pool or dataset to activate with iocage. ACTIVATE another pool to refresh the Jails list with any jails that exist on the chosen pool or dataset. Jails and downloaded FreeBSD release files are stored in a dataset named iocage/. At least 10 GiB of free space is recommended. Cannot be located on a Share. iocage automatically uses the first pool that is not a root pool for the FreeNAS® system. A defaults.json file contains default settings used when a new jail is created. The file is created automatically if not already present. If the file is present but corrupted, iocage shows a warning and uses default settings from memory. Each new jail installs into a new child dataset of iocage/. For example, with the iocage/jails dataset in pool1, a new jail called jail1 installs into a new dataset named pool1/iocage/jails/jail1. FreeBSD releases are fetched as a child dataset into the /iocage/download dataset. This datset is then extracted into the /iocage/releases dataset to be used in jail creation. The dataset in /iocage/download can then be removed without affecting the availability of fetched releases or an existing jail. iocage/ datasets on activated pools are independent of each other and do not share any data. 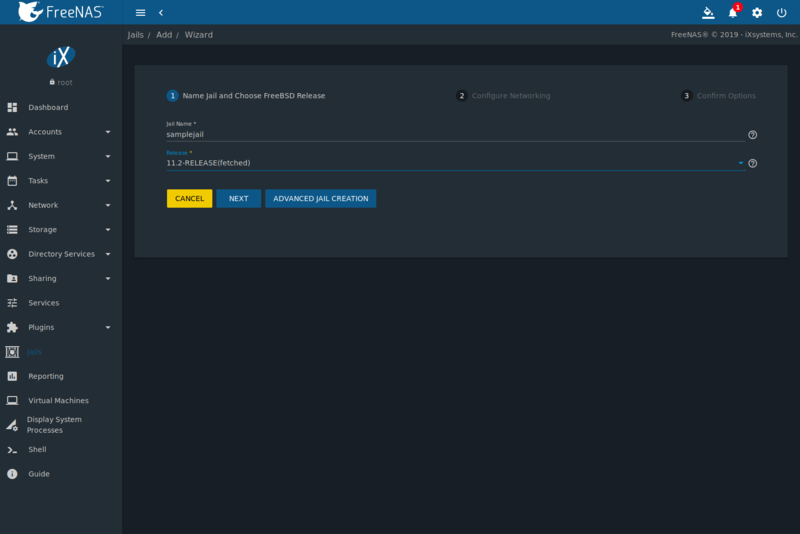 FreeNAS® has two options to create a jail. The Jail Wizard makes it easy to quickly create a jail. ADVANCED JAIL CREATION is an alternate method, where every possible jail option is configurable. There are numerous options spread across four different primary sections. This form is recommended for advanced users with very specific requirements for a jail. New jails can be created quickly by going to Jails ‣ ADD. This opens the wizard screen shown in Figure 14.2.1. The wizard provides the simplest process to create and configure a new jail. Enter a Jail Name. Jail names can only contain alphanumeric characters (Aa-Zz, 123), dashes (-), and underscores (_). Choose the version of FreeBSD to install for this jail. Previously downloaded versions display (fetched) next to their entry in the list. Click NEXT to see a simplified list of networking options. The jail can be set to automatically configure IPv4 with DHCP and VNET or IPv4 and IPv6 can be configured manually. Multiple interfaces are supported in the IPv4 Address and IPv6 Address fields by entering a comma delimited list of interfaces, addresses, and netmask in the format interface|ipaddress/netmask. Click NEXT to view a summary screen of the chosen jail options. Click SUBMIT to create the new jail. After a few moments, the new jail is added to the primary jails list. Versions of FreeBSD are downloaded the first time they are used in a jail. Additional jails created with the same version of FreeBSD are created faster because the download has already been completed. The advanced jail creation form is opened by clicking Jails ‣ ADD then Advanced Jail Creation. The screen in Figure 14.2.2 is shown. A usable jail can be quickly created by setting only the required values, the Jail Name and Release. Additional settings are in the Jail Properties, Network Properties, and Custom Properties sections. Table 14.2.1 shows the available options of the Basic Properties of a new jail. Name string Required. Jail names can only contain alphanumeric characters (Aa-Zz, 123), dashes (-), and underscores (_). Release drop-down menu Required. Choose the version of FreeBSD to download and install for the jail. Previously downloaded versions of FreeBSD display (fetched) next to the entry in the list and do not need to be fetched again. DHCP Autoconfigure IPv4 checkbox Automatically configure IPv4 networking with an independent VNET stack. VNET and Berkeley Packet Filter must also be checked. If not set, ensure the defined address in IPv4 Address does not conflict with an existing address. VNET checkbox Use VNET to emulate network devices for this jail and a create a fully virtualized per-jail network stack. See VNET(9) for more details. Berkeley Packet Filter checkbox Use the Berkeley Packet Filter to data link layers in a protocol independent fashion. Unset by default to avoid security vulnerabilities. See BPF(4) for more details. IPv4 Interface drop-down menu Choose a network interface to use for this IPv4 connection. This and the other IPv4 settings are grayed out if DHCP autoconfigure IPv4 is set. Configures the interface to use for network or internet access for the jail. Enter an IPv4 address for this IP jail. Example: 192.168.0.10. IPv4 Netmask drop-down menu Choose a subnet mask for this IPv4 Address. IPv4 Default Router string Type none or a valid IP address. Setting this property to anything other than none configures a default route inside a VNET jail. Auto Configure IPv6 checkbox Set to use SLAAC (Stateless Address Auto Configuration) to autoconfigure IPv6 in the jail. IPv6 Interface drop-down menu Choose a network interface to use for this IPv6 connection. Configures network or internet access for the jail. Type the IPv6 address for VNET and shared IP jails. Example: 2001:0db8:85a3:0000:0000:8a2e:0370:7334. IPv6 Prefix drop-down menu Choose a prefix for this IPv6 Address. IPv6 Default Router string Type none or a valid IP address. Setting this property to anything other than none configures a default route inside a VNET jail. Notes string Enter any notes or comments about the jail. Auto-start checkbox Start the jail at system startup. Similar to the Jail Wizard, configuring the basic properties, then clicking SAVE is often all that is needed to quickly create a new jail. To continue configuring more settings, click NEXT to proceed to the Jail Properties section of the form. Table 14.2.2 describes each of these options. devfs_ruleset integer Number of the devfs(8) ruleset to enforce when mounting devfs in the jail. The default value of 0 means no ruleset is enforced. Mounting devfs inside a jail is only possible when the allow_mount and allow_mount_devfs permissions are enabled and enforce_statfs is set to a value lower than 2.
exec.start string Commands to run in the jail environment when a jail is created. Example: sh /etc/rc. See jail(8) for more details. exec.stop string Commands to run in the jail environment before a jail is removed and after any exec_prestop commands are complete. Example: sh /etc/rc.shutdown. exec_prestart string Commands to run in the system environment before a jail is started. exec_poststart string Commands to run in the system environment after a jail is started and after any exec_start commands are finished. exec_prestop string Commands to run in the system environment before a jail is stopped. exec_poststop string Commands to run in the system environment after a jail is started and after any exec_start commands are finished. Run commands in a clean environment. The current environment is discarded except for $HOME, $SHELL, $TERM and $USER. $HOME and $SHELL are set to the target login. $USER is set to the target login. $TERM is imported from the current environment. The environment variables from the login class capability database for the target login are also set. exec_timeout integer The maximum amount of time in seconds to wait for a command to complete. If a command is still running after the allotted time, the jail is terminated. stop_timeout integer The maximum amount of time in seconds to wait for the jail processes to exit after sending a SIGTERM signal. This happens after any exec_stop commands are complete. After the specified time, the jail is removed, killing any remaining processes. If set to 0, no SIGTERM is sent and the jail is immeadility removed. exec_jail_user string Enter either root or a valid username. Inside the jail, commands run as this user. exec_system_jail_user string Set to True to look for the exec.jail_user in the system passwd(5) file instead of the jail passwd. exec_system_user string Run commands in the jail as this user. By default, commands are run as the current user. mount_devfs checkbox Mount a devfs(5) filesystem on the chrooted /dev directory and apply the ruleset in the devfs_ruleset parameter to restrict the devices visible inside the jail. mount_fdescfs checkbox Mount an fdescfs(5) filesystem in the jail /dev/fd directory. Determine which information processes in a jail are able to obtain about mount points. The behavior of multiple syscalls is affected: statfs(2), fstatfs(2), getfsstat(2), fhstatfs(2), and other similar compatibility syscalls. All mount points are available without any restrictions if this is set to 0. Only mount points below the jail chroot directory are available if this is set to 1. Set to 2, the default option only mount points where the jail chroot directory is located are available. children_max integer Number of child jails allowed to be created by the jail or other jails under this jail. A limit of 0 restricts the jail from creating child jails. Hierarchical Jails in the jail(8) man page explains the finer details. login_flags string Flags to pass to login(1) when logging in to the jail using the console function. securelevel integer Value of the jail securelevel sysctl. A jail never has a lower securelevel than the host system. Setting this parameter allows a higher securelevel. If the host system securelevel is changed, jail securelevel will be at least as secure. Securelevel options are: 3, 2 (default), 1, 0, and -1.
sysvmsg drop-down Allow or deny access to SYSV IPC message primitives. Set to Inherit: All IPC objects on the system are visible to the jail. Set to New: Only objects the jail created using the private key namespace are visible. The system and parent jails have access to the jail objects but not private keys. Set to Disable: The jail cannot perform any sysvmsg related system calls. sysvsem drop-down Allow or deny access to SYSV IPC semaphore primitives. Set to Inherit: All IPC objects on the system are visible to the jail. Set to New: Only objects the jail creates using the private key namespace are visible. The system and parent jails have access to the jail objects but not private keys. Set to Disable: The jail cannot perform any sysvmem related system calls. sysvshm drop-down Allow or deny access to SYSV IPC shared memory primitives. Set to Inherit: All IPC objects on the system are visible to the jail. Set to New: Only objects the jail creates using the private key namespace are visible. The system and parent jails have access to the jail objects but not private keys. Set to Disable: The jail cannot perform any sysvshm related system calls. allow_set_hostname checkbox Allow the jail hostname to be changed with hostname(1) or sethostname(3). Choose whether a process in the jail has access to System V IPC primitives. Equivalent to setting sysvmsg, sysvsem, and sysvshm to Inherit. Deprecated in FreeBSD 11.0 and later! Use sysvmsg, sysvsem,and sysvshm instead. allow_raw_sockets checkbox Allow raw sockets. Utilities like ping(8) and traceroute(8) require raw sockets to operate inside a jail. When set, the source IP addresses are enforced to comply with the IP address bound to the jail, ignoring the IP_HDRINCL flag on the socket. allow_chflags checkbox Treat jail users as privileged and allow the manipulation of system file flags. securelevel constraints are still enforced. allow_mlock checkbox Allow jail to run services that use mlock(2) to lock physical pages in memory. allow_mount checkbox Allow privileged users inside the jail to mount and unmount filesystem types marked as jail-friendly. allow_mount_devfs checkbox Allow privileged users inside the jail to mount and unmount the devfs(5) device filesystem. This permission is only effective when allow_mount is set and enforce_statfs is set to a value lower than 2.
allow_mount_nullfs checkbox Allow privileged users inside the jail to mount and unmount the nullfs(5) file system. This permission is only effective when allow_mount is set and enforce_statfs is set to a value lower than 2.
allow_mount_procfs checkbox Allow privileged users inside the jail to mount and unmount the procfs(5) file system. This permission is only effective when allow_mount is set and enforce_statfs is set to a value lower than 2.
allow_mount_tmpfs checkbox Allow privileged users inside the jail to mount and unmount the tmpfs(5) file system. This permission is only effective when allow_mount is set and enforce_statfs is set to a value lower than 2.
allow_mount_zfs checkbox Allow privileged users inside the jail to mount and unmount the ZFS file system. This permission is only effective when allow_mount is set and enforce_statfs is set to a value lower than 2. The ZFS(8) man page has information on how to configure the ZFS filesystem to operate from within a jail. allow_quotas checkbox Allow the jail root to administer quotas on the jail filesystems. This includes filesystems the jail shares with other jails or with non-jailed parts of the system. allow_socket_af checkbox Allow access to other protocol stacks beyond IPv4, IPv6, local (UNIX), and route. Warning: jail functionality does not exist for all protocal stacks. vnet_interfaces string Space-delimited list of network interfaces to attach to a VNET-enabled jail after it is created. Interfaces are automatically released when the jail is removed. interfaces string Enter up to four interface configurations in the format interface:bridge, separated by a comma (,). The left value is the virtual VNET interface name and the right value is the bridge name where the virtual interface is attached. host_domainname string Enter an NIS Domain name for the jail. host_hostname string Enter a hostname for the jail. By default, the system uses the jail NAME/UUID. exec_fib integer Enter a number to define the routing table (FIB) to set when running commands inside the jail. ip4_saddrsel checkbox Only available when the jail is not configured to use VNET. Disables IPv4 source address selection for the jail in favor of the primary IPv4 address of the jail. ip4 drop-down Control the availability of IPv4 addresses. Set to Inherit: allow unrestricted access to all system addresses. Set to New: restrict addresses with ip4_addr. Set to Disable: stop the jail from using IPv4 entirely. ip6_saddrsel string Only available when the jail is not configured to use VNET. Disables IPv6 source address selection for the jail in favor of the primary IPv6 address of the jail. ip6 drop-down Control the availability of IPv6 addresses. Set to Inherit: allow unrestricted access to all system addresses. Set to New: restrict addresses with ip6_addr. Set to Disable: stop the jail from using IPv6 entirely. resolver string Add lines to resolv.conf in file. Example: nameserver IP;search domain.local. Fields must be delimited with a semicolon (;), this is translated as new lines in resolv.conf. Enter none to inherit resolv.conf from the host. vnet_default_interface drop-down Set the default VNET interface. Only takes effect when VNET is set. Choose a specific interface, or set to auto to use the interface that has the default route. Choose none to not set a default VNET interface. vnet0_mac string Leave this blank to generate random MAC addresses for the host and jail. To assign fixed MAC addresses, enter the host MAC address and the jail MAC address separated by a space. vnet1_mac string Leave this blank to generate random MAC addresses for the host and jail. To assign fixed MAC addresses, enter the host MAC address and the jail MAC address separated by a space. vnet2_mac string Leave this blank to generate random MAC addresses for the host and jail. To assign fixed MAC addresses, enter the host MAC address and the jail MAC address separated by a space. vnet3_mac string Leave this blank to generate random MAC addresses for the host and jail. To assign fixed MAC addresses, enter the host MAC address and the jail MAC address separated by a space. The final set of jail properties are contained in the Custom Properties section. Table 14.2.4 describes these options. owner string The owner of the jail. Can be any string. hostid string A new a jail hostid, if necessary. Example hostid: 1a2bc345-678d-90e1-23fa-4b56c78901de. hostid_strict_check checkbox Check the jail hostid property. Prevents the jail from starting if the hostid does not match the host. comment string Comments about the jail. depends string Specify any jails the jail depends on. Child jails must already exist before the parent jail can be created. mount_procfs checkbox Allow mounting of a procfs(5) filesystems in the jail /dev/proc directory. mount_linprocfs checkbox Allow mounting of a linprocfs(5) filesystem in the jail. host_time checkbox Synchronize the time between jail and host. Enable automatic ZFS jailing inside the jail. The assigned ZFS dataset is fully controlled by the jail. Note: allow_mount, enforce_statfs, and allow_mount_zfs must all be set for ZFS management inside the jail to work correctly. jail_zfs_dataset string Define the dataset to be jailed and fully handed over to a jail. Enter a ZFS filesystem name without a pool name. jail_zfs must be set for this option to work. allow_tun checkbox Expose host tun(4) devices in the jail. Allow the jail to create tun devices. Click SAVE when the desired jail properties have been set. New jails are added to the primary list in the Jails menu. Clicking Jails shows a list of installed jails. An example is shown in Figure 14.3.1. Table 14.3.1 describes each column. Jail The name of the jail. IPv4 Address Listing of configured IPv4 addresses. A static IPv4 address is displayed if set manually. DHCP (not running) is displayed if the jail is stopped and was configured using DHCP. DCHP:ipaddress is displayed if the jail is running and was configured using DHCP. IPv6 Address Listing of configured IPv6 addresses. Status up indicates the jail is running and down indicates the jail is stopped. Type Indicates the installation method where jail was installed using Jails and pluginv2 was installed using Plugins. Release The FreeBSD version the jail is based on.  (Options) Click to display the options shown in Figure 14.3.2. Operations can be applied to multiple jails by selecting those jails with the checkboxes on the left. After selecting one or more jails, icons appear which can be used to ▶ (Start),  (Stop), 🕓 (Update), or  (Delete) those jails. Click  (Options) for a jail to see all options for that jail. Figure 14.3.2 shows the menu that appears. Table 14.3.2 describes each option available for a jail. Modify the IP address information for a jail by using  (Options) Edit instead of issuing the networking commands directly from the command line of the jail. This ensures the changes are saved and will survive a jail or FreeNAS® reboot. Edit Used to modify the settings described in Table 14.3.1. A jail cannot be edited while it is running. The settings can can be viewed, but are read only. Mount points Open the Mount Points list. Select an existing mount point to Edit or click ADD to open the Add Mount Point screen. A mount point gives a jail access to storage located elsewhere on the system. A jail must be stopped before adding, editing, or deleting a Mount Point. See Additional Storage for more details. Restart Stop and immediately start an up jail. Start Start a jail that has a current Status of down. Stop Stop a jail that has a current Status of up. Update Runs freebsd-update to update the jail to the lateset patch level of the installed FreeBSD release. Shell Access a root command prompt to interact with a jail directly from the command line. Type exit to leave the command prompt. Delete Delete the jail, all of the jail’s contents, and all associated Snapshots. Back up the jail’s data, configuration, and programs first. There is no way to recover the contents of a jail after deletion! Menu entries change depending on the jail state. For example, a stopped jail does not have a Stop or Shell option. Click  (Options) ‣ Update to update a jail to the most current patch level of the installed FreeBSD release. This does not change the release. To upgrade a jail to newer release of FreeBSD, stop the jail and click  (Options) ‣ Edit for the jail. Open the Release drop-down menu, choose a newer RELEASE of FreeBSD, and click SAVE. Upgrading a jail can take an extended amount of time, depending on connection speed and if the chosen RELEASE is already fetched on the system. It is possible to manually remove unused releases from the /iocage/releases/ dataset after upgrading a jail. The release must not be in use by any jail on the system! The ssh daemon sshd(8) must be enabled in a jail to allow SSH access to that jail from another system. 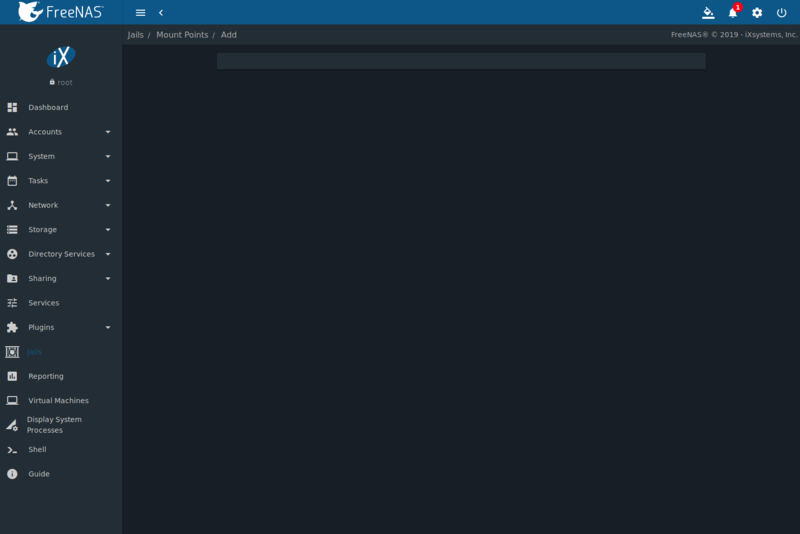 A root shell can also be opened for a jail using the FreeNAS® UI Shell. Open the Shell, then type iocage console jailname. Using sysrc to enable sshd verifies that sshd is enabled. The first time the service runs, the jail RSA key pair is generated and the key fingerprint is displayed. adduser: INFO: Successfully added (jailuser) to the user database. Finally, test that the user can successfully ssh into the jail from another system and gain superuser privileges. In the example, a user named jailuser uses ssh to access the jail at 192.168.2.3. The host RSA key fingerprint must be verified the first time a user logs in. Every jail has its own user accounts and service configuration. These steps must be repeated for each jail that requires SSH access. Jails can be given access to an area of storage outside of the jail that is configured on the FreeNAS® system. It is possible to give a FreeBSD jail access to an area of storage on the FreeNAS® system. 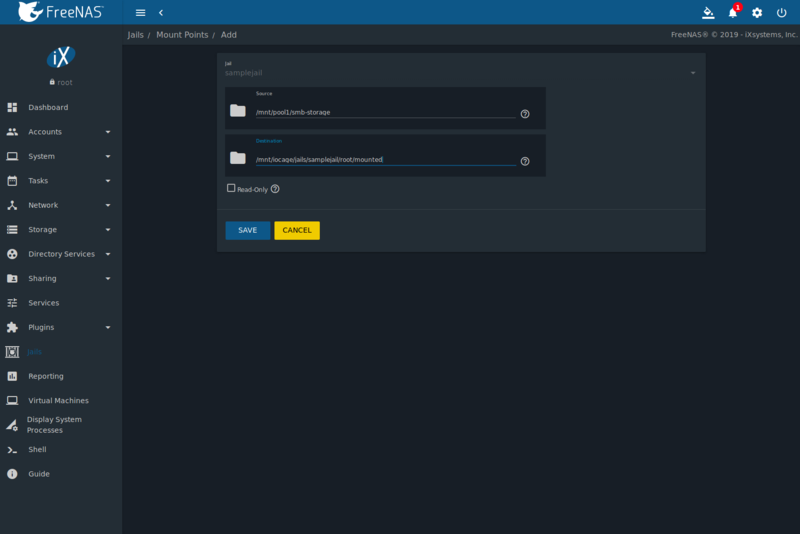 This is useful for applications or plugins that store large amounts of data or if an application in a jail needs access to data stored on the FreeNAS® system. For example, Transmission is a plugin that stores data using BitTorrent. The %brand$ external storage is added using the mount_nullfs(8) mechanism, which links data that resides outside of the jail as a storage area within a jail. The Mount points section of a jail shows any added storage and allows adding more storage. A jail must have a Status of down before adding a new mount point. Click  (Options) and Stop for a jail to change the jail Status to down. Storage can be added by clicking Jails ‣  (Options) ‣ Mount points for the desired jail. The Mount points section is a list of all of the currently defined mount points. Go to Mount points ‣ ADD to add storage to a jail. This opens the screen shown in Figure 14.3.3. Source: is the directory or dataset on the FreeNAS® system which will be accessed by the jail. FreeNAS® creates the directory if it does not exist. This directory must reside outside of the pool or dataset being used by the jail. This is why it is recommended to create a separate dataset to store jails, so the dataset holding the jails is always separate from any datasets used for storage on the FreeNAS® system. Destination: Browse to an existing and empty directory within the jail to link to the Source storage area. It is also possible to add / and a name to the end of the path and FreeNAS® automatically creates a new directory. New directories created must be within the jail directory structure. Example: /mnt/iocage/jails/samplejail/root/new-destination-directory. Decide whether the jail will be given access to existing data or a new storage area will be allocated. If the jail accesses existing data, edit the permissions of the pool or dataset so the user and group accounts have the desired read and write access. If multiple applications or jails are to have access to the same data, create a new group and add each needed user account to that group. Use the jail Mount points ‣ ADD to select the the Source of the data and the Destination where it will be mounted in the jail. To prevent writes to the storage, click Read-Only. After storage has been added or created, it appears in the Mount points for that jail. 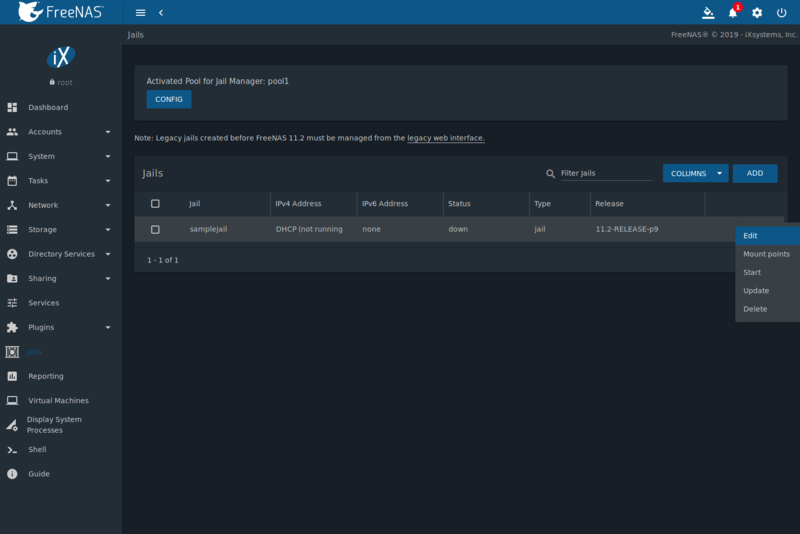 In the example shown in Figure 14.3.4, a dataset named pool1/smb-storage has been chosen as the Source as it contains the files stored on the FreeNAS® system. The user entered /mnt/iocage/jails/samplejail/root/mounted as the directory to be mounted in the Destination field. To users inside the jail, this data will appear to be in the /root/mounted directory. Storage is automatically mounted as it is created. Mounting a dataset does not automatically mount any child datasets inside it. Each dataset is a separate filesystem, so child datasets must each have separate mount points. Click  (Options) ‣ Delete to delete the storage. Remember that added storage is just a pointer to the selected storage directory on the FreeNAS® system. It does not copy that data to the jail. Files that are deleted from the Destination directory in the jail are really deleted from the Source directory on the FreeNAS® system. However, removing the jail storage entry only removes the pointer. This leaves the data intact but not accessible from the jail. See Using iocage for more details about different iocage commands. The quickest and easiest way to install software inside the jail is to install a FreeBSD package. FreeBSD packages are precompiled and contain all the binaries and a list of dependencies required for the software to run on a FreeBSD system. A huge amount of software has been ported to FreeBSD. Most of that software is available as packages. One way to find FreeBSD software is to use the search bar at FreshPorts.org. When prompted, press y to complete the installation. Messages will show the download and installation status. If the port does not provide any compile options, it saves time and preserves the FreeNAS® system resources to use the pkg install command instead. The FreshPorts.org listing shows whether a port has any configurable compile options. 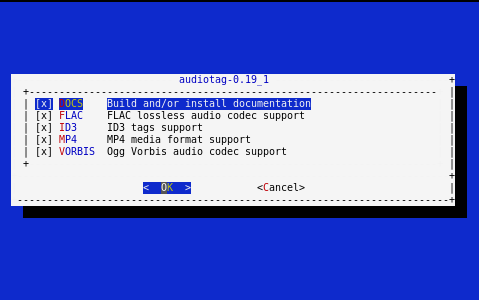 Figure 14.4.1 shows the Configuration Options for audiotag. This port has five configurable options: DOCS, FLAC, ID3, MP4, and VORBIS. Stars (*) show which options are enabled. Packages use default options. Ports let the user select options. Use the arrow keys to select an option and press spacebar to toggle the value. Press Enter when satisfied with the jail options. The port begins to compile and install. After options have been set, the configuration screen is normally not shown again. Use make config to display the screen and change options before rebuilding the port with make clean install clean. Many ports depend on other ports. Those other ports also have configuration screens that are shown before compiling begins. It is a good idea to watch the compile until it finishes and the command prompt returns. Installed ports are registered in the same package database that manages packages. The pkg info can be used to determine which ports were installed. After packages or ports are installed, they must be configured and started. Configuration files are usually in /usr/local/etc or a subdirectory of it. Many FreeBSD packages contain a sample configuration file as a reference. Take some time to read the software documentation to learn which configuration options are available and which configuration files require editing. Run tail /var/log/messages to see any error messages if an issue is found. Most startup failures are related to a misconfiguration in a configuration file. Beginning with FreeNAS® 11.0, the iocage command line utility is included for creating and managing jails. Click the Shell option to open the command line and begin using iocage. There is built-in help displayed by entering iocage --help | less. Each subcommand also has help. Display help by adding the --help flag after the subcommand name. For example, iocage activate --help shows help for the activate subcommand. The iocage manual page is accessed by typing man iocage | less. The iocage project also has documentation available on readthedocs.io. Creating a jail automatically starts the iocage configuration process for the FreeNAS® system. Jail properties can also be specified with the iocage create command. This example shows an abbreviated list of the properties for examplejail. The iocage manual page (man iocage) describes even more configurable properties for jails. Property: notes has been updated to This is a testing jail.